There is something particularly enjoyable about a female villain in fiction, written for readers who expect women to be pure, perfect, and positive. I did a podcast miniseries in 2012 on jaw-droppingly awful, truly appalling female characters, all behaving badly. It was immense fun to research and write, because these characters are so vile that when I’m reading them, they make me (metaphorically) rise up and shout in outrage. 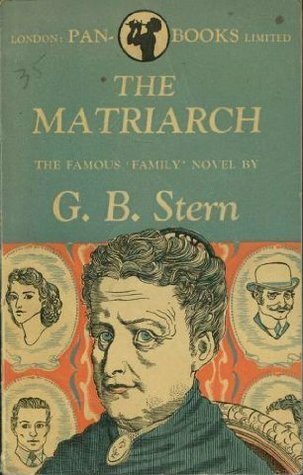 In G B Stern’s The Matriarch (1924) we are cowering before the most unstoppably interfering Jewish mother I’ve ever read. 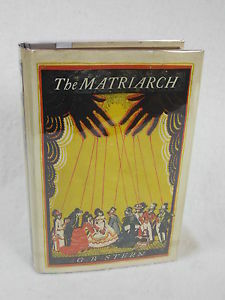 The Matriarch is the first in a loosely connected series of superb novels about the Rakonitzes’ family life in the nineteenth and twentieth centuries, in London, Paris, and Vienna, and anywhere where there was life and liveliness and the Uncles could do business and their adored elder sister Anastasia could entertain. Anastasia Rakonitz is the Matriarch, the mother of about six children, grandmother of about 15, and aunt and great-aunt to around twenty other hapless descendants. This tentacled family network criss-crosses Europe with gaiety, colour, jewels and splendid carpets, torrents of conversation, lavish parties, much fussing and organising, and above it all, the loud and peremptory voice of Anastasia Rakonitz proclaiming ‘Me you can teach nothing’. This is quite true: nobody can teach her anything, unless it’s recipes or medicinal remedies, and even then her own will always be better. All this would be perfectly fine, marvellously entertaining, as a rich taste of the high life as lived in the great European capitals before the First World War, if it were not for Anastasia’s habit, strongly connected with her facility for being unteachable, of bullying. She adores her brothers and sons and her nephews and her sons-in-law: the women of her family are crushed beneath her will. They have to get up and cook, the men can lie in bed to await their breakfasts. The daughters-in-law and girl cousins are ignored and scolded and enslaved by the Matriarch, while the men can avoid arguments and always have their advice asked. The birth of a grandson or great-nephew will always get more attention than the illness of a daughter or daughter-in-law. 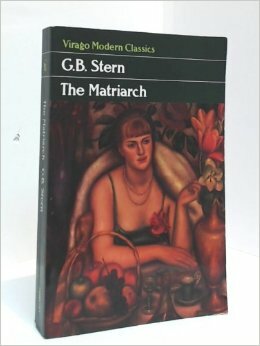 Women are to be bought and sold like jewels, these maidens of Israel, but that is all they are for: to make new family alliances for Anastasia to take under her control, and to produce boy babies at regular intervals. The Rakonitzes carry on like this as if the world will never change, and then there is a crash: the Uncles lose all their money in a fraudulent ruby mine, and the family have to move from their Kensington houses to shabbier parts of London, like Hammersmith and Bayswater. The family is also changed: all but one of the men of the family kill themselves, die of a stroke, or disappear, leaving a tribe of wailing Jewish mothers to struggle to feed and clothe the orphans. A short way into this struggle for recovery, the family are hit again by the First World War, and modern ways of living. Anastasia is getting older, and madder, and more and more uncontrollable. The family is turning into a nightmare, and the grandchildren who are growing up are showing, very clearly, their hereditary strengths and weaknesses. The boys are more or less useless: good at avoiding trouble and responsibility. The girls are hard workers and full of determination, and the strongest of them all is Toni, Antoinette Rakonitz, who is the Matriarch’s eldest grand-daughter, and the heir to her dominance over the family. 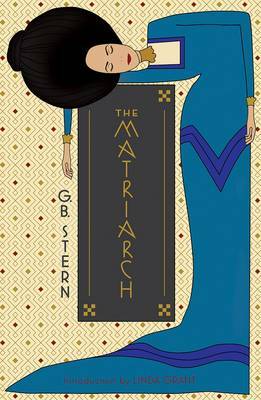 The Matriarch is a marvellous novel. It’s told in extracts of family story and history, endless anecdotes told with breathless excitement at the sheer glamour of it all. The names of ancient relatives dating from the Napoleonic Wars shower down like confetti: forgettable as individuals but contributing to a dense fog of wealth and civilised values. Anastasia the Matriarch is the centre of it all, the spider in the web: full of joyous good humour and not letting anyone forget it. I don’t enjoy large family gatherings myself, so the descriptions of the Rakonitzes’ glory days when every birthday was celebrated by the entire extended family, and every wedding had to be discussed for weeks by every adult family member who could be summoned for this purpose, from Budapest and San Remo, all this fuss and escalating excitement makes me hide in a corner. I’d rather go for a long muddy walk in the rain than sit through loud meals and endless planning constantly interfered with by the Matriarch, but that’s probably because the Rakonitz way of life is not my heritage. That doesn’t mean I don’t enjoy it, I do; I just wouldn’t want to be trapped inside it. The Matriarch presides over these festivals to glorify the Rakonitz inheritance, and becomes more peculiar each year. She has her good times, when she’s a jolly old lady with all her senses, and she has her bad times, when she is a manic fiend, rushing all over town at all hours of the day and night, collecting carpet menders to take to her son’s house at two in the morning, or demanding the return of all her daughter Truda’s household linen because she, Anastasia, had only lent it to Truda when they had to move house four years earlier. Anastasia has a strange kind of intermittent senile dementia that no-one knows how to do anything about, so they hide out of the way while it lasts, and clean up the mess and pay the unexpected bills when it’s over. Such a character should be pitied rather than loathed, but I do loathe Anastasia. Why is that? She loves her family, she lives only for her family, and she wants to help everyone she meets. For me, that’s the thing: she’s an interfering and officious old bag who will not stop meddling, and will not leave well alone. Because she is rich, or was until the crash, she had monetary power, and assumed that her power bought her love as well. She expects to be told everything first, to be asked first, to be consulted first: if any family news does not reach her immediately she is furious and deeply hurt. To be so demanding and self-important makes her loathsome. 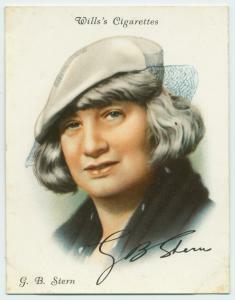 G B Stern herself: who could resist collecting this card? But it’s not all bad. Toni, the Young Matriarch, will save the family. She will repay Isaac Cohen the six hundred pounds that her uncle Blaise died owing, by her own hard work and thrift from the age of 16. Toni will sacrifice an awful lot of her youth and energy to support her own mother, brother, and grandmother, as well as the debt, and Anastasia will know nothing about it. Toni takes on responsibility, when her brother, and her male cousins, are more interested in having a good time. Selfishness is matched against responsibility, and for a long time Toni is wholly admirable. But now and again, she too has her bad times, when she blows her savings to go dancing, or takes a room in the Savoy so she can sleep for one night in luxury without sharing a bathroom. In her pride at supporting her own family, and in acting as the de facto head of the family, Toni begins to adopt some of the Matriarch’s other, not so nice, little ways. She tells cousin Derek’s married mistress that Derek doesn’t really have any money, so Derek’s windfall will be made available to help Toni pay Blaise’s debt. She supports the family before anything else, and before anyone else, and loses a lover because of it. Toni is the Young Matriarch: we can see in her where Anastasia went wrong, and it’s not forgiveable. Anastasia created Toni’s ideas about interference, and bullying, and the needs of the family to the ends of time, and that is why Anastasia is a monster, for ruining Toni’s future. 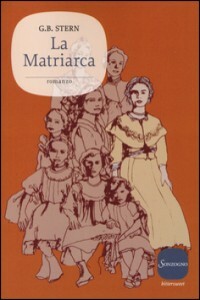 The Rakonitz novels are The Matriarch (1924, published earlier as Tents of Israel), A Deputy Was King (1926), Mosaic (1930), Shining and Free (1935) and The Young Matriarch (1942). They overlap quite a lot in their reuse of anecdotes and retellings of events in the accumulated family history, so reading them all in sequence in one glorious go is not recommended. 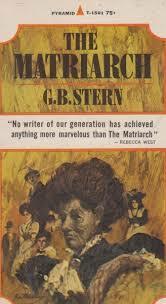 I’ve loved G B Stern’s autobiographical musings but I have yet to read much of her fiction. This sounds wonderful, and I do have a Virago copy somewhere. Hi Fleur! It’s such a great novel, deeply satisfying and beautifully written.